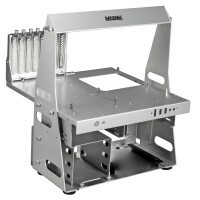 The PC-T60 belongs to Lian Li's first series of benchtables. These are mad of ananondized aluminium and they're therefore very light. We now have to clarifiy if they're also as ergonomic as Lian Li's cases. On the following pages we will show you the strengths and weaknesses of the Lian Li PC-T60.